When working on a Plugin I noticed that the path to its files is not always complete, which depends on the WordPress version. With WordPress Version 2.8 the function plugins_url() extends and it can be incorporate in a much cleaner way, no maintenance of the folder required, where the Plugin is put. An example will illustrate it and possibly will help the one or other author at his work. Since WordPress 2.7 exists an API for the comment area. Thereby you can purge the PHP-portion within comments.php. Jean-Baptiste shows a simple solution to count comments. This solution is very well known and get used pretty much since the first release of WordPress. But if you like to have a filter, which counts only the trackbacks or only the comments, then this solutions is worthless. Besides that, the How To is pretty poor and PHP-rookies could have troubles with it. Relating to this and because of many questions about this topic I show you two simple functions, which you insert in your functions.php of your theme. Normally they get used as output in your comments.php. In a previous post, I showed the possibility, how to use WordPress in regard to Corporate Identity. For example adjusting the login area. This shouldn't be a tough task with the according articles. In both cases I didn't talk about how to deactivate the default WordPress layout, since I always used the example based of the WordPress stylesheet. But the stylesheet of WordPress isn't really lean and why should you load unnecessary data, which you really don't need? With a little hook and an appropriate function I can disable to load the stylesheet of WordPress and load my own CSS - How that works can be read in both articles about adjusting theme login. 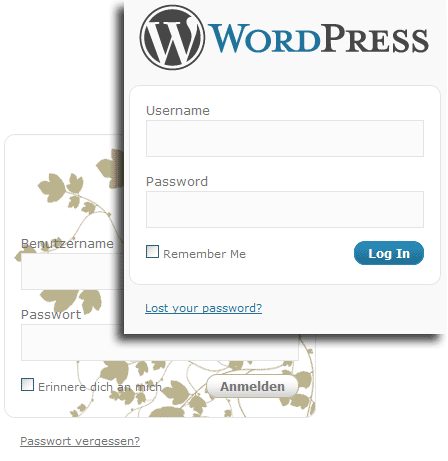 WordPress 2.7 has been released these days and comes with some updates to the backend design. I think most of you already know that there is a new login-section. The design is now equal to the new backend's and the team did only little changes. From my point of view this is very important to an all-inclusive-package, like a theme – or a corporate design. The CSS changed a bit and if anybody wants to customize the login-section, I will show how to achieve it. The CSS is also included as a good starting point for your own custom design. With the upcoming WordPress release version 2.7 the menu changes to the vertical. This offers several features to the author which we already mentioned in some other posts. But this time I explicitly address Plugin authors and ask them to make their Plugins more user friendly in terms of usability. I will show only two tiny features. Each of them have been discussed several times on the wp-hacker-mailing-list, but nearly everybody considers them as big improvements to usability. Finally WordPress 2.7 is coming along with widgets in the dashboard area, so it will be possible to adjust your dashboard as you like. For Plugin or theme authors it's even more interesting, since they can give the users additional value to their Plugins. They can offer information from their Plugin directly on the dashboard. The user can decide if he likes to display them or not. It's easy to integrate and can be controlled like Meta Boxes (explained in detail). The following example shows how you can integrate a widget in a dashboard.